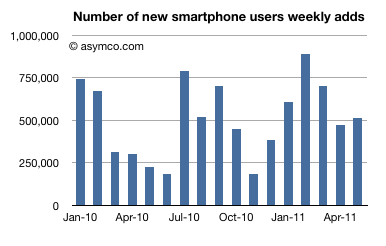 A total of 513k users switched into using a smartphone every week during the period, a rate of switching consistent with the last 17 periods (average of 510k/wk). 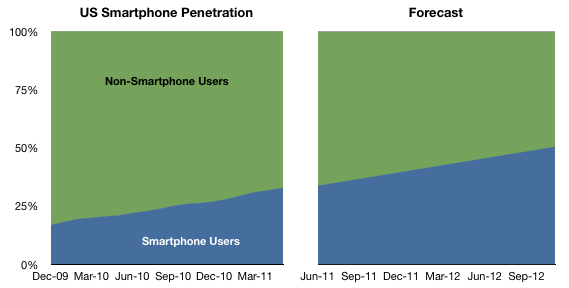 Penetration of smartphones increased by 940 basis points, slightly higher than the 900 bp increase in the last period but consistent with average. Using a four-period trailing average and linear extrapolation, 50% penetration will be reached by August 2012. “Summer 2012” seems a safe bet as that target has not changed much. I’ve updated the countdown counter (Phone Tipping point at top of right column on this page) to reflect the new date. The following charts show the penetration and switching rates.